Remi got a new bike for his birthday (August 26th) this year. We just got around to purchasing the helmet today. I was very surprised at his selection. It was a nice blue helmet with a bear on the side. No problem. However, there was a really cool "Bob the Builder" helmet and another cool "Hot Wheels" that we also offered as choices. But, no; the blue bear helmet and Remi were obviously a match made in Heaven. It works out though because the generic helmet was something like 10 bucks cheaper. Phew! We also got around to repairing the training wheel. 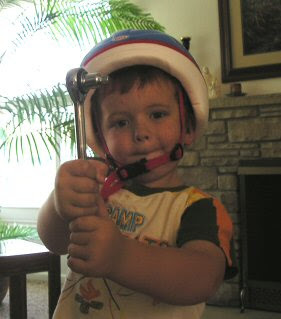 Remi felt very official in his new helmet and with the socket wrench that we used. He can't quite ride the bike, yet. However, he can't quite use a socket wrench, yet, either, so at least we're consistent.